Keeping up to date with the major developments in the Calais Migrant Crisis. The Road Haulage Association warns drivers and haulage companies not to arrive at Calais ‘with hours to spare’, or take rest breaks within sixty miles of the port. Migrants are also said to be swapping between vehicles during Channel crossings, see below. CALAIS MIGRANT CRISIS PETITION: 3,384 signatures. 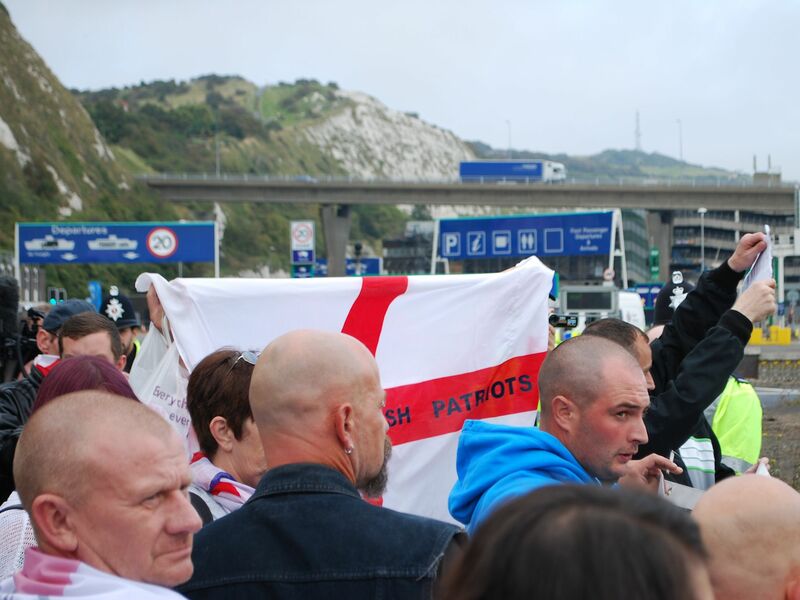 Freedom of Information figures obtained by the BBC show that up until August this year 203 migrants had been arrested at Dover Port, compared with 148 in 2013, 105 in 2012, 119 in 2010 and 139 in 2009. Greece warns of a humanitarian crisis as 22,089 migrants arrive so far this year, 65% from Syria, compared to 6,834 in the whole of 2013 says Ekithermerini. ‘Parcelforce workers in Coventry were shocked to find three asylum seekers hiding behind sacks of letters when they opened up their lorry last Friday,’ reports The Daily Mirror. A group of migrants has been trying to access trailers opposite the Esso garage at Ouistreham (the port of Caen in north west France) this morning reports @Justice4Trucker. 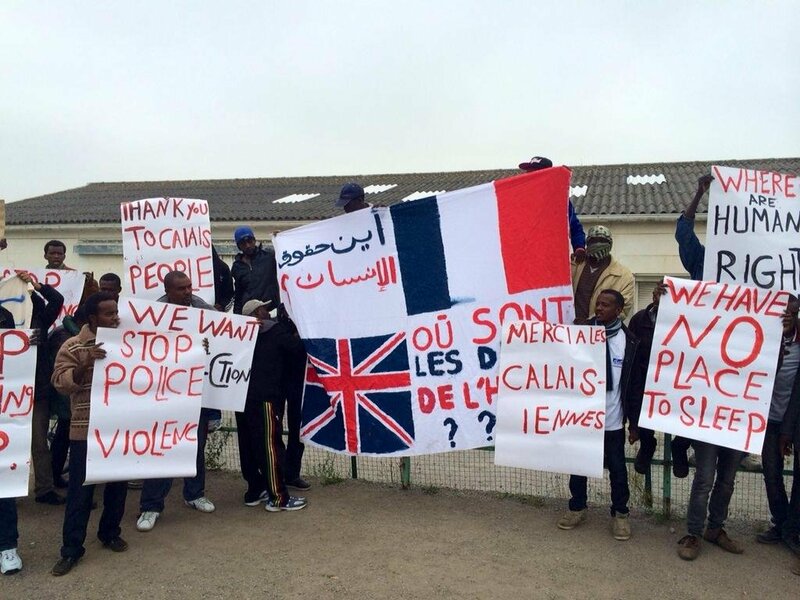 ‘We’re not wanted in France, we’re not welcome here,’ migrants from the Calais camps tell thelocal.fr. They say it takes months to get an appointment with the authorities and in the meantime they have to survive as best they can. The country can cater for 22,000 asylum seekers but had 65,000 applications last year. French police are expected to press ahead with a demonstration on the entry/exit road to Calais port this morning (see Daily Mail report). A leaflet from the ‘Unite SGP Police Force Ouvriere’ union tells protestors to gather at the G1 roundabout on the junction of the city centre road and the N216/A216 Rocade Est eastern bypass at 10:00. From there a peaceful ‘go-slow’ road blockade is expected into the centre of town. Local police have advised drivers to avoid exit 47 of the A16 (also junction with the A26). Update 11:00BST: the police demonstration is now on the A16 motorway moving in the direction of Boulogne (westbound). Exit time from the port appears to be reduced to 15mins. Update 10:00BST: better attended than thought, bolstered by hauliers and farmers. Delay at Calais exit currently 30minutes. See #Calais for the latest. Update 09:45BST: local police says the procession is moving up the port road – A216 – towards the A16 motorway. It doesn’t seem massively attended but drivers are advised to avoid the area. Meanwhile, a two week campaign by 20,000 police in 25 EU countries to ‘detect, detain and deport’ illegal immigrants – called Operation Mas Maiorum, starting today – has been branded inhumane by human rights groups. Up to 450,000 such people are believed to be living in the EU though no official figures exist. Initial reports says around 12 migrants were found in the back of a refrigerated truck as it arrived in Eastbourne this afternoon. The driver phoned police and all the clandestines were taken into custody. Twelve suspected illegal immigrants were discovered in the back of a refrigerated truck on the M6 near Cannock this morning after the driver heard shouts and banging says the Birmingham Mail. The motorway was closed in both directions briefly for a medical helicopter to attend but all the men were discharged by staff at the scene and have now been handed over to border police. Food prepared by volunteers at the migrant camp in Calais was rejected for not being spicy enough reports thelocal.fr. One aid workers says the refugees are ‘a bit too pampered by now’. 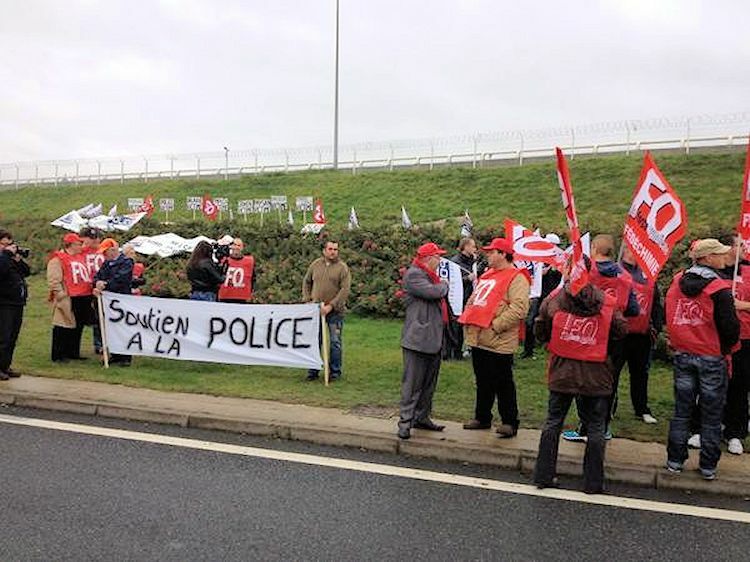 Police union ‘Unite SGP Police Force Ouvriere’ is organising a ‘Day of Action’ next Monday, 13 October, from 10:00, a go-slow on the Calais ring-road. Perhaps FNTR, see Weds 1 October, might see this as their opportunity? Support the Calais to Dover Truckers says volunteers will attend Dover next Saturday to help drivers by looking underneath vehicles for clandestines. Six stowaways spent 30 hours in a refrigerated truck from Greece before attempting an escape after the Hungarian vehicle crossed the Austrian border from Italy on Saturday says thelocal.at. All six were suffering from hypothermia. 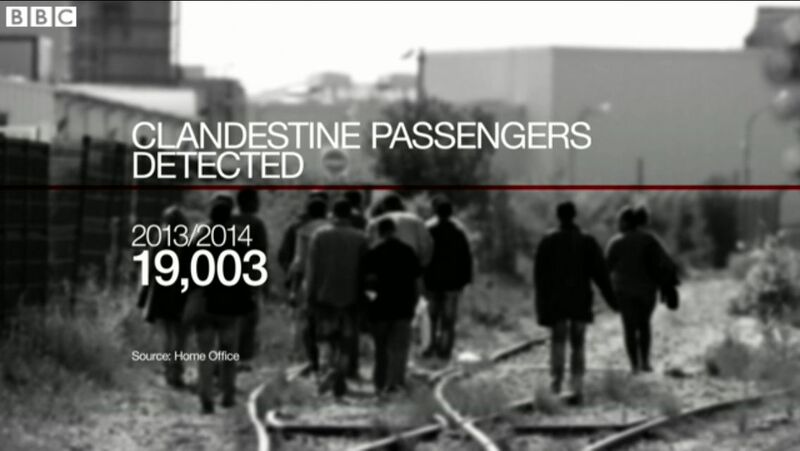 Separately yesterday, 38 migrants were arrested on a train heading from Italy to Germany. German police patrolling around the Austrian border near Rosenheim routinely pull in 30 refugees each day says Deutsche Welle. Around 5,000 have been discovered so far this year compared to 4,000 in the whole of last year. Meanwhile, special task force refugee patrol groups are being set up on the Austrian side of the border says thelocal.at. Interior minister Johanna Mikl-Leitner says there are no plans to re-introduce formal border controls in ‘the coming weeks’ but that the government is ready to do so if necessary. French truckers union FNTR threatens to blockade Calais port over the migrant crisis though does not specify a time and date. Meanwhile, Support the Calais to Dover Truckers says it too will blockade Calais ‘in the New Year’. A Dover woman returned from a shopping trip to find an alleged illegal immigrant from Eritrea sat on her doorstep says the BBC. Meanwhile, a would-be illegal immigrant made it as far as Gloucester on-board a school coach yesterday despite the vehicle being searched – and another migrant found – in Calais. Turkish truck drivers queueing at the Bulgarian border are also complaining about refugees secreting themselves aboard vehicles says Novinite. Reconstruction at the main Kapitan Andreevo checkpoint has led to lengthy queues. Drivers found with clandestines are arrested. Fines for each ‘clandestine passenger’ could rise by almost half to nearly £3,000 according to a new consultation on the ‘civil penalties scheme’ reports Commercial Motor. See below. The death toll of migrants crossing the Mediterranean has now formally passed the 3,000 mark according to the International Organisation for Migration, more than double the previous record set in 2011. The ‘Dover Blockade’ managed to briefly block the approach road to Eastern Docks in Dover this afternoon but essentially passed off without major incident. See more here. The media may have written off the Dover demonstration as a far-right event but the BBC did at least pick up on the central issue: that truck drivers face a £2,000 fine for each ‘clandestine passenger’ that manages to secrete themselves on a vehicle, whether or not the driver is aware. Read more here: ‘Desperate migrants’ waiting to pounce on Calais truckers. The ‘Dover Blockade’ this weekend, see below, will be bolstered by protestors from Calais. A post from the organisers on the ‘Support the Calais to Dover Truckers’ facebook page from earlier today says, ‘The French group can’t blockade Calais because the French police have brought in water cannons and are out in force isn’t it a pity they couldn’t do this for the past 12 months.so they are coming over to Dover to join us.’ The protest is set to run from 13:00 Saturday until 17:00 Sunday. The organisers have also called for a ‘lawful protest with no abusive language and no drunken yobs.’ An article in Wednesday’s Dover Express said protestors were being encouraged to bring smoke bombs. The UK Home Office stonewalls Commercial Motor’s attempts to find out how many/if any trucks at Calais are being scanned before boarding ferries saying the information is operationally sensitive. 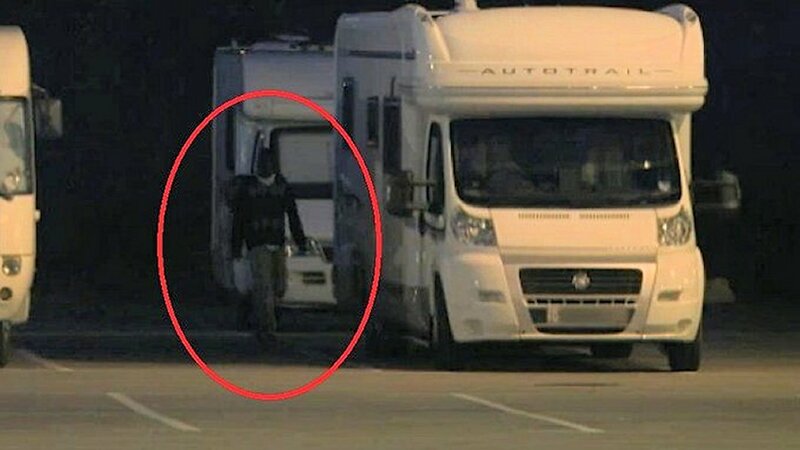 An edition of ITV’s Tonight programme called Back Door Britain – screened 24.9 at 19:30 – filmed clandestines attempting to sneak aboard campervans parked near Calais. Photo: ITV/Tonight. A cruise ship rescued 345 people including 52 children believed to be Syrian refugees fifty miles off the coast of Cyprus in bad weather early this morning. After initially refusing to leave the ship the group was eventually taken to a camp near Nicosia. More than 300 people have signed up so far to take part in the ‘Dover blockade’ this Saturday, organised by “Support the Calais to Dover Truckers” (see below). The protest is due to start at 13:00 with more details released on Friday. Meanwhile, a French group called ‘Sauvons Calais’ (Let’s Save Calais) is apparently organising a rally at the same time. A previous demonstration earlier this month in the town centre resulted in a violent stand-off with left wing groups. Kent Police tell Commercial Motor they are ‘actively engaging with the protestors via social media… to ensure the facilitation of both the right to peacefully protest and people’s right to go about their daily business unimpeded.’ CM also says Tommy Harrison from the ‘UK & European Lorry Drivers Safety At Or Near French Ferry Ports’ facebook group, see petition above, has written to members asking them not to attend Saturday’s protest. Screen grab from BBC Breakfast. British and foreign truck drivers were fined £1m last year for carrying ‘clandestine passengers’ as the numbers discovered climbed from 11,731 two years ago to 19,003 now. BBC Breakfast filmed Craig Burkinshaw from Brian Yeardley International in Wakefield as he drove through Calais this week. See more here. 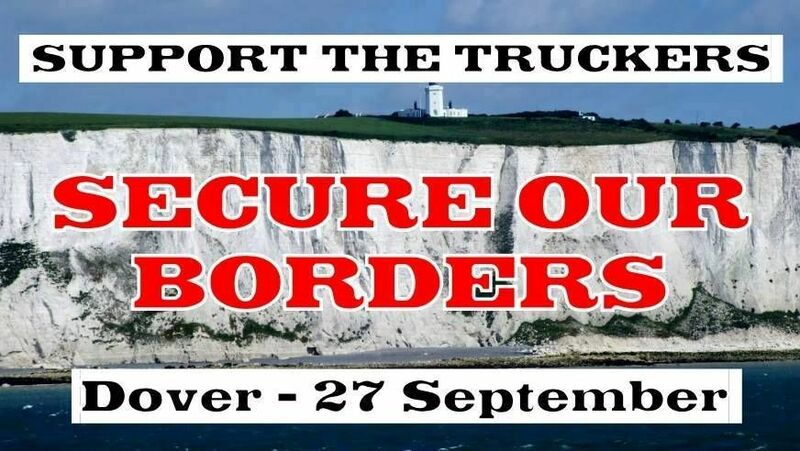 With some truckers reportedly taking out personal loans to pay fines for – inadvertently – carrying would-be illegal immigrants into the UK, a Facebook group called Support the Calais to Dover Truckers is organising a blockade of Port of Dover on Saturday 27 September. Kent police told the BBC ‘wilful obstruction of the highway’ was illegal, the port said it was monitoring the situation while the Freight Transport Association refused to back the protest but expressed sympathy with drivers facing huge fines. Judging by the rest of the content on their site, this group is as concerned with immigration itself – legal and illegal – as they are with the plight of unlucky truck drivers. Read more from the BBC, or see ‘Support the Calais to Dover Truckers’ facebook page. Horrific details emerged about the sinking of a migrant boat off Malta earlier this month when 300 people drowned in a BBC interview with Malta PM Joseph Muscat. Traffickers allegedly rammed the boat and hacked off the hands of people clinging to the wreckage. Thirteen suspected illegal immigrants were arrested on the M25 near Chertsey in Surrey this morning after climbing from the back of a truck in the middle of rush hour reports Sky News. The layout of Calais Port will be changed, fences erected along the road in and out, security beefed up around parking areas and new detection equipment installed, all paid for by a new joint fund from the British and French governments it was announced this afternoon. The UK will contribute £4m each year for the next three years. ‘Twenty-four Eritrean migrants have been found in the back of a refrigerated yoghurt lorry in Kent after they were heard knocking and pleading for oxygen,’ reports the BBC adding that one man has been arrested for ‘facilitation offences’. An ambulance attended but was quickly stood down. Commercial Motor reports that truck scanning equipment in Calais is not being used because border guards think it is against stowaways’ human rights to x-ray vehicles without warning or permission. Three alleged illegal immigrants apparently tried to make their escape from underneath a truck on the M6 near Walsall yesterday. Witnesses saw them making for the central reservation. All three are now in custody. One would-be illegal immigrant was spotted on top of a grain lorry at Dover this morning with four more inside reports Kent Online. The mayor of Calais has repeated her threat to blockade the port saying the town’s economy is being strangled by the migrant issue reports @SimonJonesNews. Another suspected illegal migrant has been discovered, secreted underneath a motorhome in Ashford, Kent. The driver says he heeded advice not to stop close the Channel and think the man must have hidden while they waited at the Channel Tunnel. 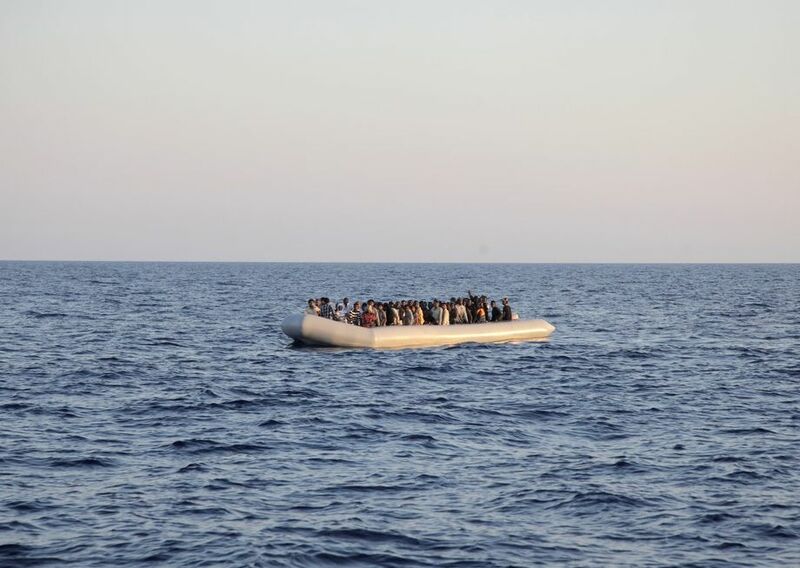 Horrific reports from the Mediterranean where 500 migrants from North Africa drowned at the weekend after their boat was allegedly, deliberately rammed by traffickers. The boat set off from Damietta in Egypt on Saturday 6 September. Another 250 migrants are feared dead off the coast of Libya. The death toll is approaching 3,000 so far this year, four times that last year, while 108,000 migrants have landed in Italy since January, more than twice that in the same period 2013. With around 1,500 migrants widely reported to have congregated in Calais, these latest figures put paid to the theory that the UK is somehow specifically targeted. Close but no cigar. Dover Lifeboat called out to a suspected illegal immigrant on a windsurf board off Sandgate near Folkestone reports @SimonJonesNews. Handed over to Immigration. An eye-opening long read from Germany’s Der Spiegel on the work of the EU’s border agency, Frontex, concentrating on the borders between Spain and Morocco, Greece and Turkey, and Hungary and Serbia. Far from being a soft touch, the accusation is that the organisation directly or indirectly presides over a tough and brutal regime as it builds Fortress Europe. Seven suspected illegal immigrants found yesterday in the back of a lorry in Paddock Wood near Tonbridge, Kent, reports @SimonJonesNews. Handed over to Immigration. A group of around twenty migrants managed to scale security fences around the port in Calais again this afternoon reports @SimonJonesNews. They were apparently quickly rounded up by police. Meanwhile, @RTM_ChrisDruce from Road Transport Media says he is looking in to claims French authorities are not using scanners at Calais. Also, reports from local newspapers (via @Justice4Truckers) in Birmingham and Kent that hauliers are avoiding the Dover-Calais route due to the migrant situation, and potential fines faced by drivers who, inadvertently or not, carry illegal migrants. Austria is also now considering reinstating border controls. A day after authorities in Bavaria threatened to reinstate borders, see below, the Austrian Vice Chancellor says the number of illegal migrants travelling through the country to get to Germany is a ‘substantial problem’ reports thelocal.at; 600 arrived at Munich rail station in June and July alone. Where there is a ‘serious threat to public policy or internal security’ – such as a sudden influx of migrants – a country can temporarily suspend the border-free Schengen Agreement. Another stowaway reported hiding underneath a motorhome last Tuesday, spotted after he escaped when the vehicle was stuck in a traffic jam on the M25 according to the BBC. The couple, from the Vale of Glamorgan, Wales, were returning from France via the Eurotunnel. Again it begs the question of why truckers are fined up to £2,000 per stowaway when car drivers are not. Meanwhile, the state of Bavaria in southern Germany is considering reintroducing border controls to stem the flow of migrants from Italy via Switzerland and Austria according to the ANSA news agency. Bavarian Governor Horst Seehofer says, ‘Unless the situation changes, Germany will have to seriously weigh the possibility of stopping infractions via border controls.’ Last month, the Bavarian Interior Minister accused Italy of ‘deliberately ignoring standard refugee procedures’. As right and left wing groups clash in Calais over the migrant crisis, in today’s Sunday Telegraph Immigration Minster James Brokenshire says the security fencing from last week’s NATO conference in Wales – nine feet high and twelve miles long – could be given to the port authorities. He would also like to see secure parking areas. The BBC reports also more stowaway incidents: one man hidden in a motorhome yesterday and two more in another vehicle. The RHA says 300 people have been discovered on 69 trucks so far this week. Car drivers, caravaners, motor-homers and other ports affected now too. Truck drivers have been running a gauntlet of migrant gangs in Calais for months. Now it seems the trouble is spilling over to car drivers, caravaners, motor-homers and other ports too. One ferry operator told @DriveEurope this week that a customer driving a convertible car had items stolen from the back seat after being surrounded by migrants in the queue for passport control in Calais at the weekend. The Times reported on Monday that caravaners and motor-homers had been targeted by migrants attempting to stowaway. Today the BBC reports on the arrest of another stowaway, found hiding in the back of a passenger car after crossing from France yesterday. The driver said the only time the car was left unlocked and unattended during the journey from Spain was when she checked pets in at the Eurotunnel terminal. Eurotunnel is telling passengers to be vigilant. ‘We’ve been warning truck drivers for a while now to be on the lookout for people sneaking into their trailers in car parks, now we’re just extending this advice to motorists,’ said a spokesman. Events at Calais seem to be spinning out of control. Last night reportedly hundreds of migrants tried to storm on-board P&O and MyFerryLink ferries, see video above (via Mark Salt). As British and French officials argue over who should take responsibility, the deputy mayor of Calais told the BBC World at One programme today that the next step may be a temporary blockade of the port.